I was on my way home when I got a phone call from Mark Song about acting in "Refuge" as an entry for the Cathay Motion Picture Awards 2013, 78 hour competition to produce a 78 second film surrounding the theme of "Tomorrow". I have not met Mark or any of the team members before, so I took a U-turn to meet them. 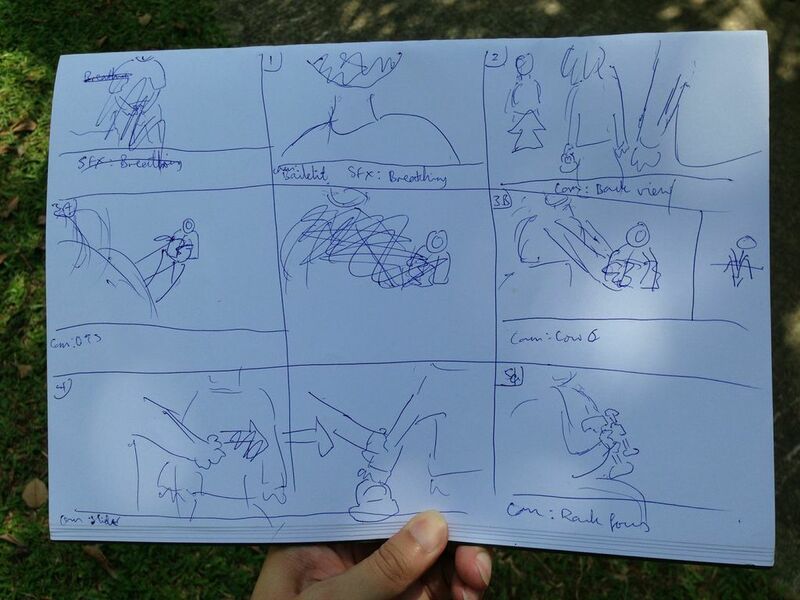 The team: Mark, Eddy, Daniel and Lydia, were seated around a table at Starbucks discussing the script when I arrived. They had just came out of Cathay's briefing and the clock had started ticking. Then, we were still busy arguing about the script and calling friends to fill the daughter role. Daniel, the director, fills the role of the robber, I fill the father role and finally Aki came on board as the daughter. This, after many rejections and disappointments at the eleventh hour. 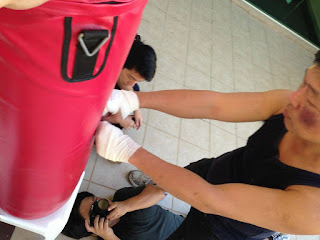 With the cast out of the way, it was down to pestering a friend to lend us a punching bag and agreeing on the location. 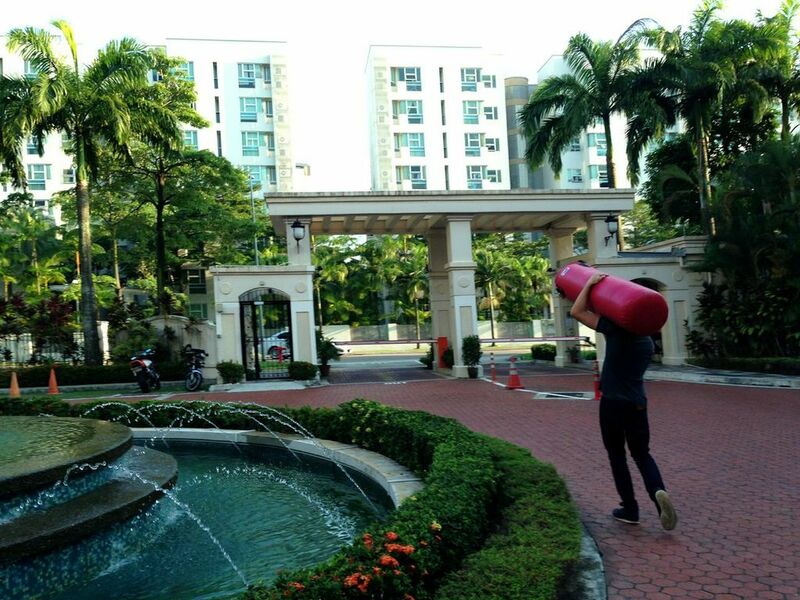 We agreed to use my condominium gym and the park nearby, for the peace, quiet and convenience. I left the crew after dinner, while they sorted the story board, camera shots and call times for tomorrow. Originally, the father was to defend her daughter against her abusive boyfriend that motivated him to train hard to protect her better in the future. We felt that this conveys the unintended message of revenge and so we replaced the 'boy friend' with a random robber. 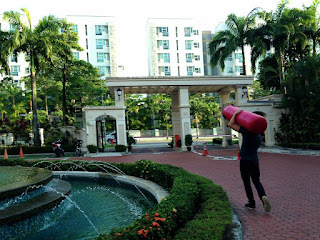 We met up for breakfast at 10am by the condo pool after lugging the hefty punching bag up the stairs. Shooting started subsequently in a park down the road. The difficult part in the park were the camera positions and angles, and the actors' movements since there was an action sequence. We repeated it till we got the correct frames without clutter in the background and without my falling onto a tree or seriously injured by stray punches. The ambient light was reasonable. It was not too harsh, neither was it cloudy. There were very few people in the park, if at all, so we didn't need to do any crowd control. The difficulty in the gym was that we didn't have a ceiling hook to hang the punching bag, and so we sat it on a plastic chair. Funny enough, it was the noise of the plastic chair rocking away that enhanced that aggressive sound of punches. Some serendipity. The gym is also small and that is one reason you find many close-up shots. Unfortunately, the make-up artist couldn't make it, so we relied on Aki and what Daniel rapidly learned from Youtube the night before. Straight after production, Mark and Eddy proceeded to the reading room to edit, while Lydia worked in tandem with the boys to compose the soundtrack. The first rough cut is done and we went for dinner before going home at 10pm. We still needed the refinements, a written narrative and a sound track. Some other robber you may meet in future. After a good night's sleep the crew continued their work in the morning and completed the film in the 72th hour. In short, we scripted, casted, got the props, acted, shot, edited and composed the sound track, to produce a 78 second film about "Tomorrow", in 72 hours. Watch out for our voting link to help us win!